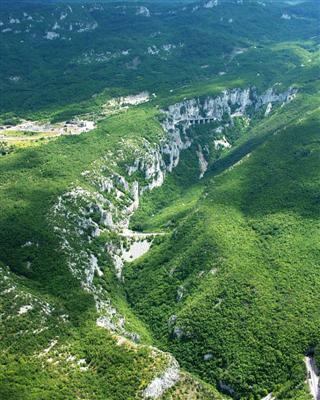 Učka Nature Park is characterised by an exceptional variety of features in a comparatively small area. Učka is probably the only place in the world where one can take a photograph of the endemic Učka or Tommasini bell-flower (Campanula tommasiniana) and one of the last European locations where patient bird watchers will be rewarded with impressive glimpses of the Eurasian griffon vulture (Gyps fulvus) or golden eagle (Aquila chrysaetos). These species are two outstanding representatives of the ornithological life to be found on Učka, which includes ca. 100 nesting birds and many other birds that occasionally visit this mountain. A distinctive characteristic of Učka Nature Park’s flora is that it is an area which, with regard to its geographical location and climate, abounds in both continental and Mediterranean species. According to the existing literature, the flora of Učka Nature Park encompasses approximately 1300 different species, which is an extraordinarily large number, considering the relatively small size of the protected area. Such a richness is a result of the previously described environmental factors, predominantly climate, geology and relief. Učka has a long tradition of botanical, especially floristic research. The first scientists to visit Učka were botanists. The list of prominent researchers is quite long, and most of the floristic papers that were published in the 20th century have widened our knowledge of the richness of the local flora. In addition, it must be emphasised that despite the centuries-long floristic research, new discoveries can still be made here. With regards to the diversity of habitats and the plant and animal species living there, Mount Učka is an important point of biological diversity on the European continent. The data about local fauna in the literature from the first half of the 20th century reveal the existence of a great number of endemic and protected species in the park, which require active care. It is estimated that we are familiar with only 40% of the total number of species that inhabit the park.